Chinese President Xi Jinping delivered a speech titled "Look Beyond the Horizon and Steer the World Economy in the Right Direction" here Friday (Nov.30) at the first session of the 13th summit of the Group of 20 (G20). It's been ten years since the global financial crisis broke out and the first G20 Summit was convened. Today, the global economy, while maintaining growth on the whole, is still not free from the underlying impacts of the crisis. Old growth drivers are yet to be replaced by new ones. Various risks are rapidly building up. The new round of technological revolution and industrial transformation are triggering profound changes, the wealth gap keeps widening, and social contradictions are growing. The world economy is facing another historical choice. An ancient Chinese philosopher observed that "Reviewing the past enables us to learn about the law governing the evolution of history." We G20 members must closely follow the underlying historical trend so as to chart the course for the future. In mankind's relentless quest for development and progress, the trend toward openness and integration among countries is unstoppable despite ups and downs in the global economy. The ever growing and expanding industrial chain, value chain and supply chain have boosted the flow of production factors across the world and led several billion people out of poverty and toward prosperity. Greater coordination and complementarity among countries meet the need of productivity growth. They will also shape the future of relations of production. In this process, countries are increasingly becoming a community with shared interests, shared responsibilities and a shared future. Going forward, win-win cooperation is the only choice for us, be it in good times or bad. This is dictated by the law of economics, and it is in keeping with the development of human history. Facing various challenges, we must have a stronger sense of urgency, be rational in approach and look beyond the horizon. We must fulfill our responsibility and steer the global economy in the right direction. The G20 was born out of the international community's need to maintain stable growth of the global economy. Over the past decade, we have braced difficulties together, navigated the global economy out of recession and brought it back to the track of recovery and growth. Ten years later, let us work with the same courage and strategic vision and ensure that the global economy grows on the right track. First, we should stay committed to openness and cooperation and uphold the multilateral trading system. Five years ago when I attended the G20 Summit for the first time, I called for joint efforts to uphold and build an open world economy. Five years on, this has obviously become an even more urgent task for us. 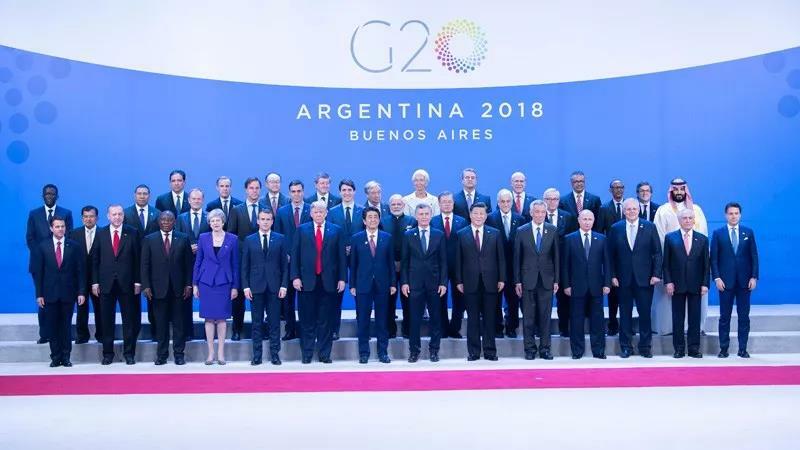 The number of new trade restrictive measures applied on a monthly basis among G20 members has doubled compared with six months ago. In 2018, the growth of trade in goods may decline by 0.3 percent globally. We should firmly uphold free trade and the rules-based multilateral trading system. China supports necessary reform of the World Trade Organization, and believes that it is critical to uphold the WTO's core values and fundamental principles such as openness, inclusiveness and non-discrimination and ensure the development interests and policy space of developing countries. We need to conduct extensive consultation to achieve gradual progress instead of imposing one's position on others. Second, we should forge strong partnership and step up macro policy coordination. Partnership is the most valuable asset of the G20. We G20 members should work together to surmount whatever difficulty that lies ahead. We should employ the three tools of fiscal and monetary policies and structural reform in a holistic way to ensure strong, balanced, sustainable and inclusive growth of the global economy. Strengthening policy coordination, which is essential for global growth, is also the due responsibility of major economies. Developed economies, when adopting monetary and fiscal policies, should give more consideration to and work to minimize the impact such policies may exert on emerging markets and developing economies. The IMF's 15th General Quota Review should be concluded on schedule. The international monetary system should become more diversified, and the global financial safety net should continue to be strengthened. Third, we should stay committed to innovation and create new momentum for growth. The global economy is embracing the trend of digital transformation, and the new round of industrial revolution will reshape human society in profound ways. We should encourage innovation and leverage the role of the digital economy in growing the real economy. We need to watch out for risks and challenges brought by the application of new technologies, and strengthen the legal and regulatory framework. And we need to do more to boost education and vocational training. We should give priority to achieving development through fully tapping our innovation potential. At the same time, we also need to keep our doors open and encourage the spread of new technologies and knowledge so that innovation will benefit more countries and peoples. To better adapt to and guide technological innovation, I propose that the G20 carry out an in-depth study on the application and impact of new technologies on a priority basis to explore new thinking and new ways of cooperation in this area. Fourth, we should stay committed to win-win cooperation to promote inclusive global development. Development holds the key to many problems facing the world today. Development also provides a strong guarantee for greater equity and justice. We need to continue to follow a people-centered development philosophy and endeavor to deliver a sense of fulfillment, happiness and security to our people. We need to continue to prioritize development in global macro-policy coordination, implement in real earnest the 2030 Agenda for Sustainable Development and give strong support to work in this area under the UN framework. We should protect the development interests and space of developing countries so as to ensure global growth that is truly equitable. We should continue to support Africa's development by helping Africa with its infrastructure and connectivity building and new industrialization. This year marks the 40th anniversary of China's reform and opening-up. During the past 40 years, with the support of the international community, we in China have forged ahead with perseverance and made historic achievements in development. In the years since the global financial crisis, China has contributed over 30 percent of global growth. China is firm in its resolve to eradicate poverty. Our goal is to eliminate absolute poverty as currently defined by 2020, and we have every confidence to meet this target. China owes its progress to reform and opening-up, and will continue to advance on this path. Earlier this month, the first China International Import Expo (CIIE) was successfully held, which was warmly received by the international community. China will continue to deepen market-oriented reform, protect property rights and IPR, encourage fair competition and do more to expand imports. The CIIE will be held annually as a way to further open China's market. In the latest World Bank Doing Business report, China moved up 32 places in the ease of doing business ranking from last year. China will continue to improve its business environment, and hopes that all countries will work together for a free, open, inclusive and orderly international economic environment.